Astronomers have produced their biggest 3D map yet of the "local" Universe. They have detailed the positions of all the galaxies, and galaxy groupings, out to a distance of about 600 million light-years from Earth. The work by US, UK and Australian scientists is reported in the journal Monthly Notices of the Royal Astronomical Society (RAS). The information will aid the study of cosmic evolution - to explain why the Universe takes the form it does. 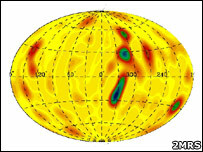 Known as the 2MASS Redshift Survey (2MRS), the 3D map is essentially the combination of two great data-sets. One has pinpointed the 2D locations of galaxies on the sky, the other has measured the way the expansion of the Universe has stretched the light from those galaxies to gauge their distances. Galaxies tend to cluster together, and these groupings form superclusters; and even huge filaments and sheets that enclose colossal voids in space. 2MRS sees this detail in a bigger volume of space than any previous astronomical survey. It plots not only all of the visible material in the near Universe, but also gives clues to the distribution of the mysterious "dark matter" that scientists cannot detect directly but which they believe is woven in amongst the normal matter. "Once we have the galaxies and the dark matter, we can predict how they will interact with each other; we can look into the dynamics of the local Universe," explained Dr Pirin Erdogdu of Nottingham University, UK, and lead author on the RAS paper. "This will tell us where our local group of galaxies is going, for instance; a matter of some controversy over the past 20 years," she told BBC News. According to 2MRS, our Milky Way galaxy, its sister galaxy Andromeda and other neighbouring galaxies in the local group are moving towards a supercluster known as the Great Attractor - at an amazing speed of about a million miles per hour. Some astronomers had previously argued it was heading towards the Shapley supercluster - a truly massive assemblage that is 200 million light-years across. The team would like to take its all-sky survey out to twice the current distance. Comparing the densities of matter in near and far space will allow scientists to test cosmological models. To fully understand how the Universe got from a "Big Bang" 14 billion years ago to display the structures we see around us today requires researchers to explain how galaxies are born, grow, merge and congregate over time.